They say the place is cursed and one shouldn’t visit the ruined town after sunset. There are evil forces, there are strange animals, the roofless facades and the eerie Haweli could make you uncomfortable even during daytime. I wish they were just false presumptions and man made stories but they aren’t. 10 friends decided to decipher the noise behind the uncanny Bhangarh fort supposedly known as the most haunted place in India. They hired a Tata Qualis, packed some beer cans, whiskey, a fresh lemon and got all set to decode the unknown. They were unaware about the road ahead but they were very much inquisitive to get a glimpse of the place known for its eeriness even in an era where almost nobody believes in the existence of ghosts. They were picked by the benevolent cab driver from various places like Gautam Nagar, Nehru Place and Lajpat Nagar. It was a bright moonlit night in Delhi; there were marriages and parties going on all around the city. The journey started at 12 O’clock midnight. Everybody updated their Facebook status before leaving Delhi saying “Going to Bhangarh – The most haunted place in India – Wish us luck”. The foggy winter night was pleasurable for everyone as they were enjoying the mist touching the window screen. They thought of playing the customised CD especially made for the trip but suddenly the CD player crashed. Music is so important someone said from the backseat. No worries, there are cell phones – someone replied. Finally there were old Hindi classic songs for a respite. 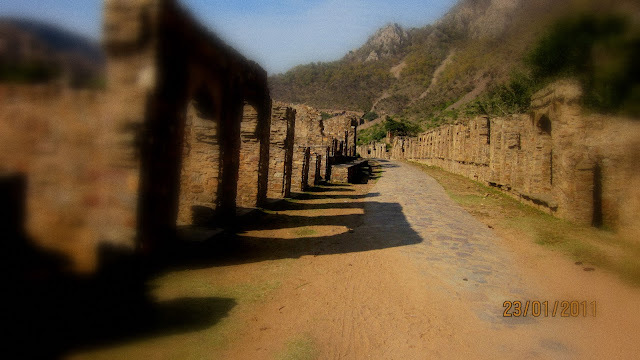 The story behind Bhangarh’s disturbing atmosphere was so very fascinating. The Tantrik (Evil magician) became the main topic of discussion among them. There are no Ghosts, they are just crap I bet – Kapil quotes from the backseat. Maybe there are some animals instead. Everybody made a picture in their mind. The talk continued and the music played in the background gave a soothing touch to the journey. The Jaipur highway was smooth as ever.